Genetic analysis of a novel fiber developmental mutant ligon-lintless-Sd (LiSd) in Gossypium hirsutum L.
Cotton fibers are single-celled trichomes that differ from the ovule epidermis. As such, they are considered a model system for studying cell elongation and cell wall biogenesis. Fiber development of mutants provide novel materials for dissecting the genetic mechanisms underlying the process. Herein, we described the characteristics and genetics of a new super-short fiber mutant, Ligon-lintless-Sd (LiSd), in upland cotton. The LiSd mutant possesses fuzz, super-short fibers (6–7 mm), normal leaves, and is relatively short plant height. Scanning electron microscopy array revealed no difference in fiber initiation between LiSd and TM-1. Microscopic observations indicated early fiber elongation, which was terminated at 8–13 days post anthesis. The results of genetic analysis revealed that short fiber phenotype was controlled by a single incomplete dominant nuclear gene, named LiSd. The results of allelic analysis in Gossypium hirsutum L. background indicated that LiSd is non-allelic to the previously described shorter fiber mutants Li1, Li2, and is therefore a novel short-fiber mutant gene. The phenotypic characteristics and genetic analyses provide a useful basis for further mapping of this gene and dissecting its molecular mechanisms of fiber elongation and the pleiotropy with plant height in cotton. 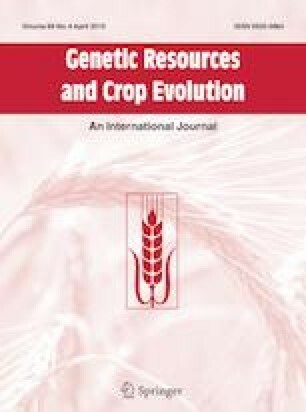 This research was financially supported by the National Key Research and Development Program of China (2018YFD0100303, 2018YFD0100304), the National Nature Science Youth Science fund project (31601348), the Major Projects for Transgenic Breeding of China (2017ZX08005-004-006), Key Research and Development Program of Shandong Province (2017GNC10114), the System of Modern Agriculture Industrial Technology of Shandong Province (SDAIT-03-03/05), the Natural Science foundation of Shandong Province (ZR2017MC057, ZR2016JL028) and The Agricultural Science and Technology Innovation Program of Shandong Academy of Agricultural Sciences (CXGC2018B01).